This year’s Independent Filmmakers Showcase will include an adaptation of Shakespeare’s Macbeth, produced by Santa Monica-based City Shakespeare Company. The screening will take place at Laemmle Music Hall in Beverly Hills on June 1 at 8:10 pm. 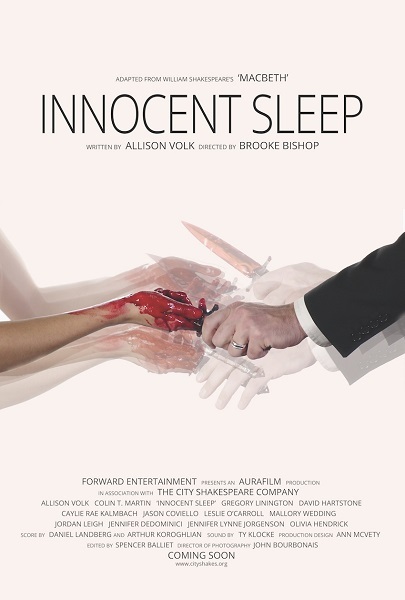 Innocent Sleep began as a site-specific theatre production staged in a Santa Monica warehouse in the Fall of 2013. Following its initial run, CityShakes artistic directors Allison Volk and Brooke Bishop decided to continue exploring the intimacy between Shakespeare’s characters and the viewer via film. Innocent Sleep stars Gregory Linington, Leslie O’Carroll, Allison Volk, Colin Martin, David Hartstone, Caylie Rae Kalmbach, Jason Coviello, Leslie O’Carroll, Mallory Marie Wedding, Jordan Leigh, Jennifer DeDominici, Jennifer Lynne Jorgenson, Olivia Hendrick, Kristin Keating, and Mindy Faulkner. The film is also available for pre-order on Vimeo On Demand.